Caused motion events ( e.g . a boy pulls a box into a room ) are basic events where an Agent ( the boy ) performs an Action ( pulling ) that causes a Figure ( box ) to move in a spatial Path ( into ) to a Goal ( the room ) . These semantic elements are mapped onto lexical and syntactic structures differently across languages This dissertation investigates the encoding of caused motion events in Turkish , and the development of this encoding in speech and gesture . First , a linguistic analysis shows that Turkish does not fully fit into the expected typological patterns , and that the encoding of caused motion is determined by the fine - grained lexical semantics of a verb as well as the syntactic construction the verb is integrated into . A grammaticality judgment study conducted with adult Turkish speakers further establishes the fundamentals of the encoding patterns . An event description study compares adults â verbal and gestural representations of caused motion to those of children aged 3 to 5 . The findings indicate that although language - specificity is evident in childrenâs speech and gestures , the development of adult patterns takes time and occurs after the age of 5 . 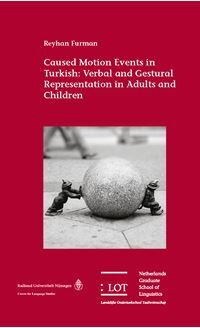 A final study investigates a longitudinal video corpus of the spontaneous speech of Turkish - speaking children aged 1 to 3 , and finds that language - specificity is evident from the start in both childrenâs speech and gesture . Apart from contributing to the literature on the development of Turkish , this dissertation furthers our understanding of the interaction between language - specificity and the multimodal expression of semantic information in event descriptions .